The bandh being organised by the Opposition parties protesting the attitude of the Modi government at the Centre in fulfilling the promises made in the AP Reorganisation Act, 2014, was partial and peaceful with no untoward incident reported in Visakhapatnam till around 10 a.m. on Friday. Most of the schools and colleges remained closed. However, failure to make an announcement in advance led to confusion among students and their parents. RTC buses and autorickshaws plied normally. “Our buses moved out of the depots in the city as usual from the early hours of Friday. Some of our buses were stopped outside the Maddilapalem Bus Depot on the National Highway-16 for sometime by the protesters,” Deputy Chief Traffic Manager (urban) Sudhabindu said. The Left parties staged a rasta roko at Maddilapalem junction and held up traffic. CPI State Assistant secretary J.V. Satyanarayana Murthy came down heavily on the Modi government for failure to give Special Category Status (SCS) to AP and to declare the new railway zone with headquarters in Visakhapatnam. 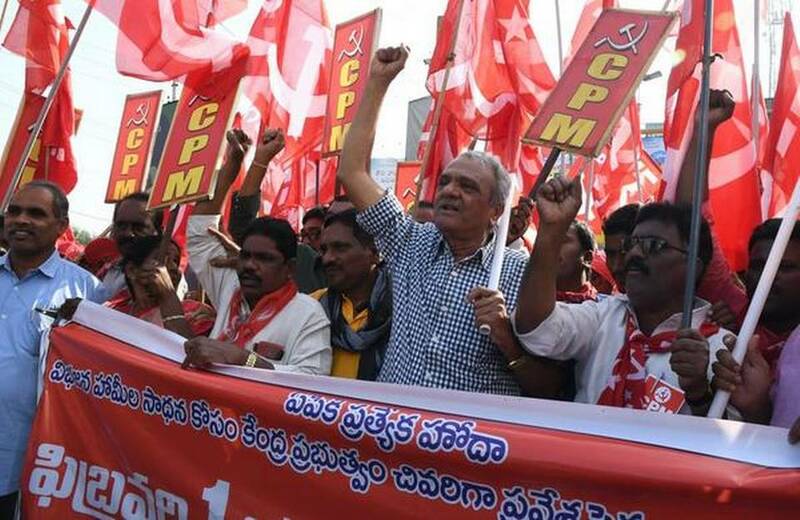 CPI-M and Jana Sena Party (JSP) are gearing to take out rallies to protest the non-implementation of the promises by the Centre.